Only in Britain would an innocuous gift shop cause such outrage. We still haven’t integrated our national past history. From The Independent: A man has been accused of inciting racism after opening a gift store and naming it ‘Really British’. Chris Ostwald, 54, who opened the independent British-themed shop in Muswell Hill, North London, on 26 November, said the reaction to the store was “political correctness gone mad”. 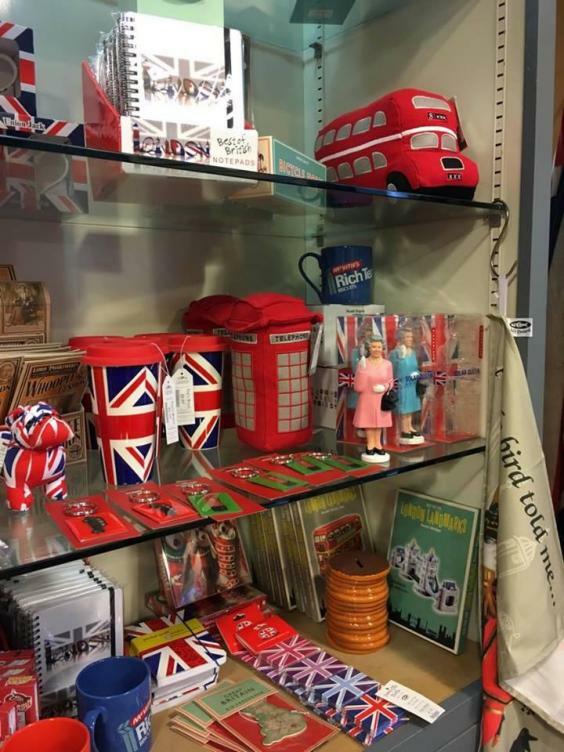 The shop, which sells a range of “quintessentially British items”, ranging from plastic figures of the Queen to English mustard, had provoked criticism even before it opened, with people claiming it would instil hatred following the “divisive referendum”. Mr Ostwald told The Independent: “It began as soon as I started setting the shop up a few months back. People would walk past and complain when they saw the sign saying ‘Really British’ that it was divisive. “Since we opened things have got even worse. Yesterday was quite a low point. Four people came in and complained. Sales have gone down since when we opened. The shop owner has also been targeted on social media, with one Facebook user and fellow Muswell Hill resident, MichaelWright, suggesting it was inappropriate to give the store such a name in the “current political climate” following the “divisive referendum”. Mr Wright wrote: “While I applaud you setting up a business in Muswell Hill and employing local people I’m curious as to why you decided to call your shop ‘Really British’ (besides the obvious point that you will sell British made goods)? “Like many people I live in London because of its international nature, and for me personally having a big sign on the Broadway saying ‘Really British’ makes me feel you’re implying that other local businesses in the area are therefore somehow ‘not really British’. We British are in need of a new story. Our old story of ‘Great Britain’ – or much more commonly these days, our truncated story of ‘Declining Britain’ – doesn’t match reality, and is depressing. It leads us, in our confusion and perceived loss of national identity, to think that we can somehow ‘take back control’, by doing things like rejecting the EU and going it alone like buccaneers of old. Here we are, a postcolonial Britain, unsure of who we are and still coming to terms with our loss of premier status in the world; a Britain disconnected from the thread of its long history, where the teaching of history in schools has become ever more reduced and relegated to isolated factoid bundles about Henry VIII or Hitler; a Britain which currently has lost its faith in our political elite and the two party system; a country now finding itself adrift with an unbalanced and overly negative view of itself. It won’t work for us just to invent a story; we need to reconnect with the national thread of our country in a different way, and then we will find we actually do have an authentic and serviceable story. Not by just harking back to the past, nor by only looking to the future, but rather by being both traditional and post traditional at once; becoming more traditional and less traditional, if you like. I think we need to connect with the stream of our country; with that elusive beast of Britishness. For thoughtful people today in Britain and elsewhere can’t help but feel at least to some degree partly alienated. We just don’t belong like we used to in the distant past when the village was our life and community and the stars and planets were like the enveloping and comforting raiments of our hermetically sealed world. Yet we are our country. it’s part of who we are, whether we like it or not, or whether it fits in with our political or intellectual persuasions or not. All the influences of the past carried forward through our culture, absorbed in our formative years and reinforced by the sheer immersive field of unspoken collective societal agreements, transmitted by example all around us. We are shaped and formed by the past, by the struggles, failures, sorrows and achievements of those who have collectively made a shift in the glacial flow of shared human – and specifically in this case – British culture. You could write a similar narrative for any nation of course, but I’m focussing on the specific British one, because it’s me; it’s you. It’s us. It’s your civilisation, as Orwell said. You can deny it, avoid it, make fun of it, convince yourself with fine words that you are beyond it, but you will still be influenced by it. Reacting against it is still being under its influence. You can move to another country, be an expat for life, but you will never escape it – you will always be British whatever you do. You can no more remove yourself from your nationality than you can remove yourself from your physical body. You can’t not be your nationality. We are our history, our country, our landscape. This living beast of Britishness is always changing, ebbing and flowing, yet a thread remains and holds a collective identity. We are not in any way separate nor superior to all the struggles and developments in humanity which have come before. The more we are conscious of what is forming us, the various stages and sets of values buried deep in our cultural and collective consciousness, and yet still living within us and influencing us – or being able to be reactivated at any moment – the better integrated we can be to have a healthier outlook to meet the challenges of the next moment. So that we don’t merely react to the past. Now we can value the great emergences of the past without looking back at them in any way nostalgically. We can see the value of such past qualities now in contemporary society – upgraded and relevant to our situation; not reaction and rejection, but rather transcend and include and integration. We can recognise again the importance of qualities such as heroism, forcefulness, order, self sacrifice for a greater cause, conviction, passion, achievement, progress; and also of the qualities of kinship, belonging and a certain re-enchantment of life – not in the way they originally emerged but in a re-contextualised manner for our own life conditions. All these qualities restored healthily in our emotional palette would be invaluable for the Britain of today. And as I mentioned, in an interesting way, this does point to us becoming both less traditional and more traditional together. This conscious embrace widens and deepens our psychological and ethical capacities and palette. This is an expanded sense of our own development which is not linear, but expands out more like a sphere with greater breadth and inclusion and which stretches back through time all at once. Weren’t you moved by those human footprints recently discovered on the Happisburgh beach in Norfolk? It is the oldest record of humans outside of Africa anywhere in the world, nearly one million years ago. The first Brits? Perhaps hard to label them as Britons, since Britain was still part of the continental landmass back then, this apparently family group would have shared the estuary of a river thought to be that of the Thames earlier course with the megafauna of the time: mammoths, hippos and rhinos. The footprints – men’s UK size 8 – (or 42, since he may have been European) and smaller ones of children, were soon washed away by the tide, but they gave us a tantalising glimpse into our far distant past. There is never a break in history; it is the story of our lives, our struggles and our development, pushing improbably against the entropy of the universe, to create ever more ingeniously, instead of the to-be-expected gradual settling into dissolution. Modern thought breaks up experience and history into discrete events and dates. It’s a useful shorthand, but also a fiction. Reality is, and always has been much more of a stream, a process where everything influences everything else, and one ‘occurrence’ flows into the next in an endless succession of becoming. It’s a shame that we don’t have a serviceable living story as a country any more. Although people might think of the British as being wedded to tradition and ceremony, this isn’t really true for the majority of us any more. History for most of us is a disconnected his-story: a few fragments of Henry VIII and Hitler. It’s not our story. Historian Simon Schama has said that modern history teaching is threatening “to cut the cord of our national memory”. Our historical psyche went into a kind of amnesia as a reaction to the aftermath of The Empire and never really recovered; and in the process, severing the connecting thread. We don’t have much sense of how we got here and what happened to help form our values, culture and identity. And we’re impoverished as a result, with effects on our view and judgement about national decisions. Having a living story has value. Certainly there have been many dreadful episodes in our history as there have been throughout the history of humankind in general, but there are also key moments which have marked genuine progress. To give an example of such a historical event which is barely known to many of us, take the Putney Debates. This pivotal episode did much to help create our modern world today; so much more than the romance between Victoria and Albert winning the ratings war on ITV at the moment. The Putney Debates took place following The English Revolution of of the 1640s. It needs a bit of detail to bring it into relief. The dramatic change precipitated by the temporary abolishment of the monarchy opened the door to a dazzling variety of experiments, some whose influence can still be felt in our present times. The revolution unleashed forces in the flow of ideas which all the later conservatism couldn’t re-cork back in the bottle. Spoken by Colonel Thomas Rainsborough in the mid seventeenth century, these were radical words indeed, and doubly so, coming from a high ranking officer way back then. For it was here in this very church on the 28th October 1647 and for the following two weeks, that a group of men from the New Model Army plus civilian representatives, met together in debate. The choice of venue wasn’t significant – the army was camped nearby just outside London, and the church was convenient. Having destroyed the King’s armies in England’s First Civil War or English Revolution – depending on how you want to look at it – the future was now inconceivably wide open; an opening which had never before existed in history. What kind of England, what kind of society and constitution did they want to see? The New Model Army was arguably one of the first armies in history to initiate democratic debates which included all its ranks. Fortunately we know about the debates in considerable detail since they were recorded verbatim. The forty or so participants in the debates were representative of all classes and included the full spectrum of opinion from right to left. There were distinguished generals like Oliver Cromwell and Henry Ireton; commanders like Colonel Thomas Rainsborough who were of humble birth but had risen in rank through the wars; there were ordinary soldiers such as Edward Sexby and farmers and small tradesmen who had never before had a voice; one attendee is only identified as ‘Buff-Coat.’ There were civilian political radicals, Levellers, on the radical left, who had come to help the soldiers state their case. Though today levellers would be seen as social democrats, back then they were extreme left radicals. Politics and religion can’t be separated in those times and nearly everyone in the debates was a Puritan – but a particular strain of Puritan who were known as ‘Independents’. They believed in freedom of conscience and in freedom of worship. No one, they felt, should be compelled to attend church or forced to conform to another person’s beliefs. They had fought wars for a just cause, for high principles, sacrificed much, and eventually after great bloodshed, won. What now was to be the future of England? Why should voting be limited only to property owners as it always had been? What about universal suffrage? Should there even be a King or Lords? Would such radical democratic changes lead to anarchy? This historic gathering tackled these immense issues head on, and for the first time, common people had the opportunity to make their voices heard. Hard though it may be for us to understand today, it was taken for granted in those times that voting should be strictly limited to those who owned property; it seemed as obvious as day that only such property owners could be responsible citizens, those people of means who had a material stake in the kingdom. The grandees such as Cromwell and Ireton could not defend by mere logic, the justness of this ancient order of voting rights based on ownership of property. They could only protest that the changes calling for universal suffrage were too radical and flatly would not be accepted by the general populace; they would result in anarchy and a return to the old monarchy which none of them wanted. The radicals maintained that the concept of the ‘freeborn’ was more important than the concept of the ‘freehold’. At one point the common soldier Edward Sexby famously spoke powerfully and bitterly after hearing the reluctance of the leaders to grant universal suffrage to all men. In the end, a fudgy English kind of compromise was reluctantly agreed upon whereby all those who had helped Parliament and fought in the revolution would have the vote but that it was not yet to be extended to the whole population. Nevertheless, the importance of the Putney debates is that they actually happened and the genie would never again be able to be fully put back in the bottle. This was a very significant advance in British democracy and constitutional reform and paved the way for many of our civil liberties we enjoy today (or we would enjoy if we realised how they had been fought for in the past and what a momentous struggle it had been). An amazing story, isn’t it? And it’s part of our story.